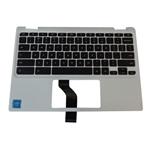 Description: New genuine Acer laptop upper case palmrest and keyboard. This upper case does not include the touchpad. This original part is white with black keys. Compatible Part #'s: 6B.G85N7.015, EAZHR00101A.